Heat the vinegar, lime slices, water, salt and sugar in a saucepot over medium heat until at a low boil and sugar and salt dissolves. Pour the brine over the daikon and reserve. Place the meat in the freezer for a few minutes to firm it up for stability when thinly slicing. Bring a large pot of water to a boil to cook soba or spaghetti to al dente, according to the package directions. Very thinly slice the beef against the grain. Heat a large, round-bottom pot over high heat; add a little oil and brown and crisp the bacon. Remove to plate and spoon off all but 3 tablespoons fat. Add the beef in small batches to the hot drippings and stir fry it until brown and crispy at edges; remove to plate. Add the scallions to blister them, then add the garlic and edamame. Toss, then add the Worcestershire sauce and Tamari; deglaze the pan with beer and reduce by half. Add the stock and simmer. 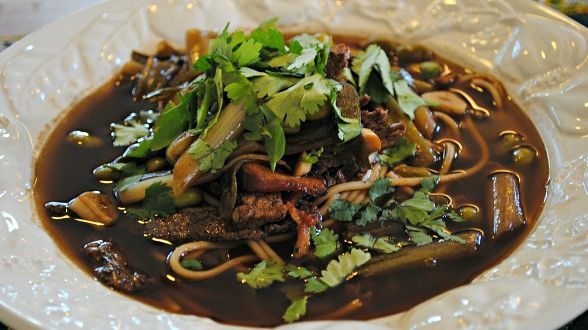 Divide the bacon, beef and noodles among bowls and top with soup. Garnish with the drained pickled daikon, shiso or cilantro leaves. In Recipes-list.com we have selected the most viewed recipes from category - uncategorized . Enjoy the best recipes specially selected for you! Beer, Bacon and Steak Soba Bowls is the right choice that will satisfy all your claims.